The other day I was working on a little sewing project while David was playing. He kept coming over to me wanting to “help” me sew. As any parent knows, a child’s help is anything but that–plus, I didn’t think that a 3-year old boy who is prone to throwing every item in sight should necessarily be “helping” with a pile of sharp pins and needles. I made him a deal, though: I would make him his own sewing project if he would just leave mine well-enough alone. 1. Start with a flat piece of cardboard. I cut apart a cereal box into pieces that lay flat. 2. 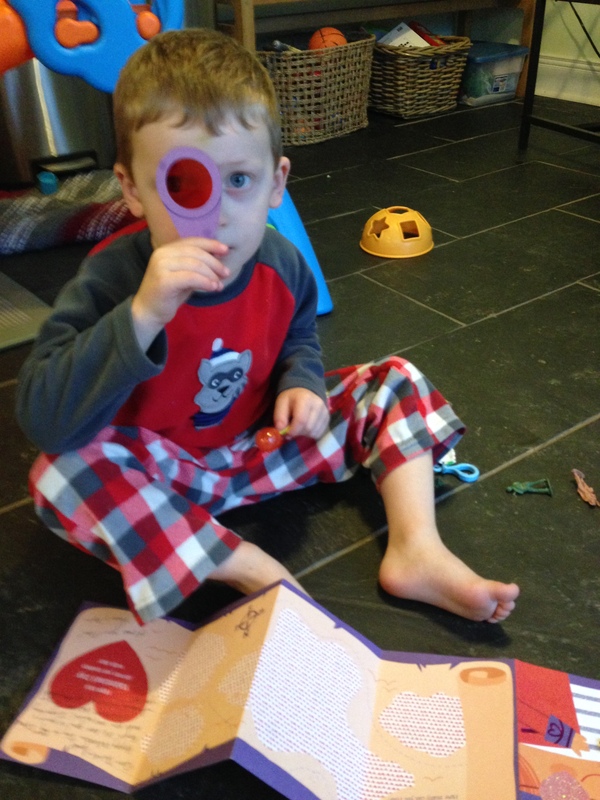 Trace the shapes that you want to use onto the cardboard. I used large children’s cookie cutters, but you could use just about any found object to trace around. Or, if you are the artistic type, you could even free-draw the shapes. It’s up to you. I ended up tracing six shapes onto one cereal box. 3. Cut out the shapes. Then, use a hole-punch to punch holes around the perimeter of each shape. Make sure the holes are not too close to the edge so the cardboard will not tear when your enthusiastic child begins lacing. 4. Tie one end of a piece of yarn or ribbon onto one of the holes with a double-knot. Cut the piece of yarn just long enough so that it can be laced through all of the holes without running out of string. Wrap a small piece of tape around the “open” end of the yarn to make a durable tip. I just used plain white yarn because that’s what I had on hand, but using a variety of colors would be much more exciting! 5. Start lacing! 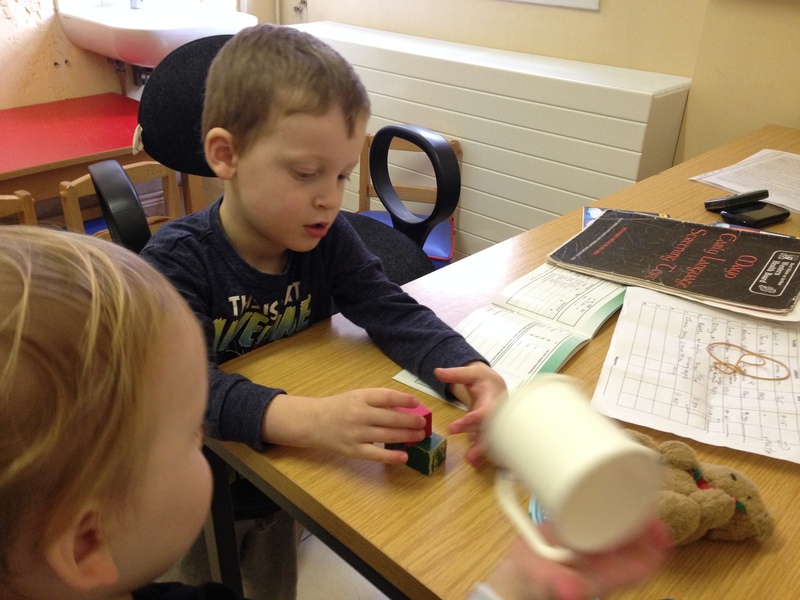 Step 1: Realize that there is no such thing as a pediatrician in Ireland. Well, maybe there is, but a pediatrician only sees rare and extreme cases of childhood ailments. Google “childhood doctors in (your city)” and discover that there is, instead, such a thing as a GP (a General Practitioner). Make an appointment with a GP. Step 2: Visit the GP and realize that he is not who you want to see either. All he does is give vaccines to babies and prescribe medicine if you’re sick. Go home confused. How will I ever know what percentile my baby is in? Who will make sure my kids are developing properly? 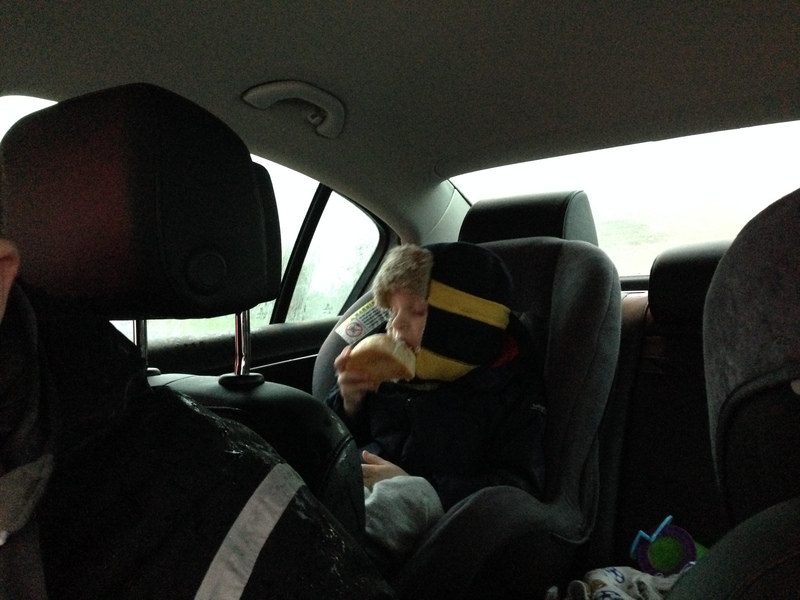 Who will pat me on the back and tell me I’m a fantastic parent? Step 3: 7 months later, discover that there is something called a Public Health Nurse. This is the person who actually weighs and measures and checks for hearing and vision. Step 4: Call to schedule an appointment with the Public Health Nurse (PHN). After 4 phone calls, realize that each PHN covers a specific region and you may only make an appointment with the PHN assigned to where you live. Call your PHN and leave a message because they do not answer the phone, they only return phone calls the next business day between 9:30 and 10:30 AM. Wait by your phone between 9:30-10:30 AM the next day to make sure you don’t miss your call; otherwise you’ll have to call back, leave another message, and wait for your call to be returned the next morning. Get the phone call, make your appointment (for the first available spot, 2 months from now), and get directions to the clinic. 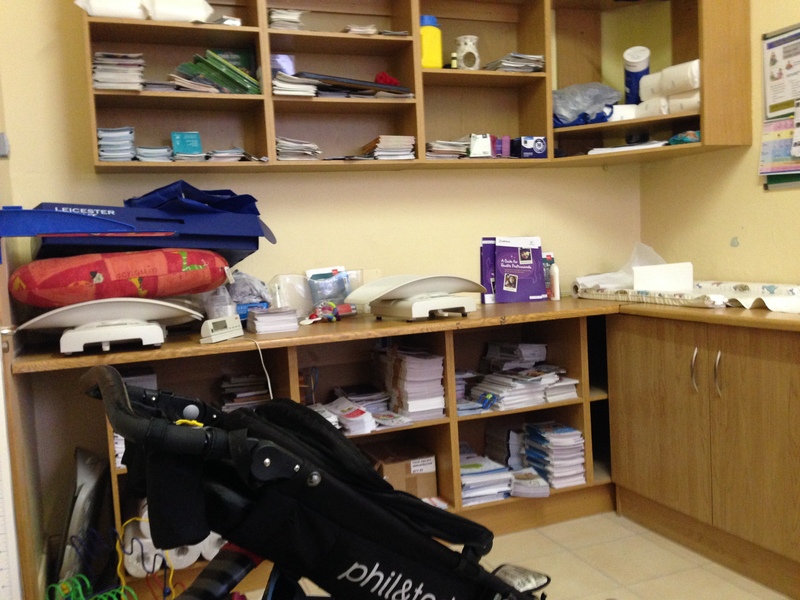 Step 5: On the morning of your appointment, drive out to the clinic. Realize that the lack of an actual address and the directions you got were too vague to actually find the building: “on Beach Street (the streets don’t have published names, so that doesn’t help) before the “Y” in the road to Monkstown (you don’t know where Monkstown is, or which direction of the “Y” leads to this place) with a railing in front (every building has a railing in front of it)”. 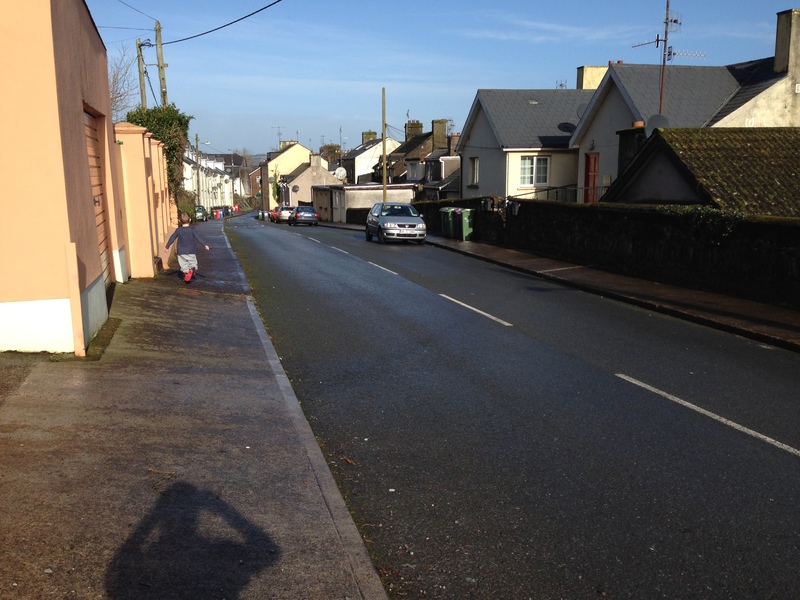 Step 6: Park your car on what you hope is Beach Street, get the kids out of the car, and stare blankly at all of the buildings with railings on (what you presume to be) Beach Street. Start knocking on every door of every building with a railing in front of it. Thank the person who eventually opens the door for you and ask her if she knows where the Public Health Nurse’s office is. 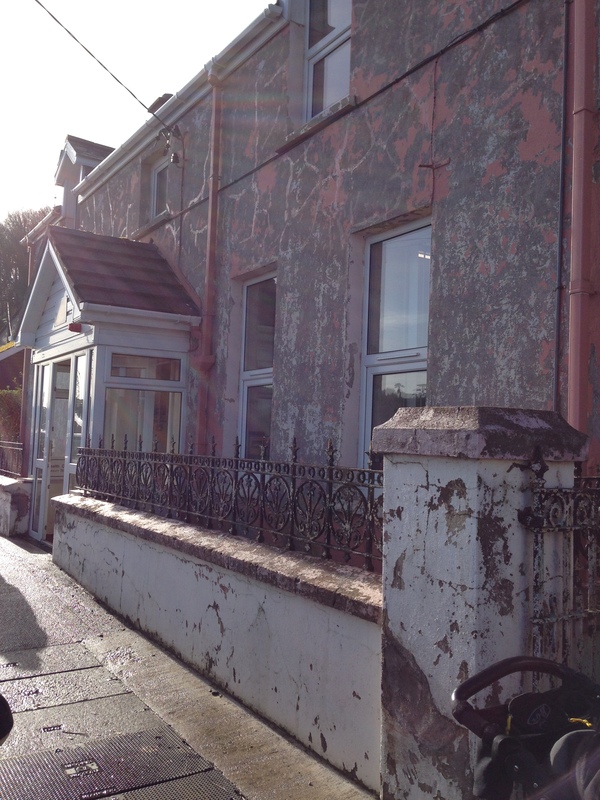 Take her advice that it is 2 doors past the pink fence and start walking up the street. Step 7: Get to an ordinary-looking house that is apparently a public health center and let yourself in. Go to the back of the house/public health center and sit in a room with a bunch of other people who look like they may be waiting to see a nurse. There is no receptionist or sign on any of the doors, so you hope you’re in the right place. See one of those bead maze thingys that they always have at doctor’s offices and assume you have found some sort of clinic anyway. Step 8: Wait. You are now 15 minutes late, but there is nobody to check in with to let them know you have arrived (at least, you think you have arrived at the correct place). Step 9: After another 15 minutes (half an hour after your scheduled appointment time) a woman will enter the building and say, “Is anyone waiting for the Public Health Nurse? I’ve just arrived”. Stand up and follow her into her exam room. Step 10: The nurse will begin to weigh and measure your children. Then she will realize (since she was at least half an hour late showing up to work) that she left all of the necessary paperwork and exam tools in another room. She will leave mid-exam and not return for 15 minutes. Try to occupy the children with all of the nurse’s paperwork that she left out on the desk. Step 11: Expect your older child to be a rampant terror while his baby brother is attempting to perform cognitive tests. Have baby watch crazy older brother instead of paying a bit of attention to the nurse who is attempting to test his brain development. Hope the nurse doesn’t diagnose baby with ADD or some sort of distractibility disorder. Step 12: After making it through the exams, ask the nurse a question. Her answer will be to talk to a man in another office in the building who is holding clinic hours today, and would you mind just going back to the waiting room to wait a turn to speak with him. Step 13: Go back to the waiting room. Sit for 20 minutes with two tired, cranky children. Feed them lollipops to quiet them up, even though you just swore to the Public Health Nurse that your childrens’ nutrition was your top priority. Step 15: Leave the health center. 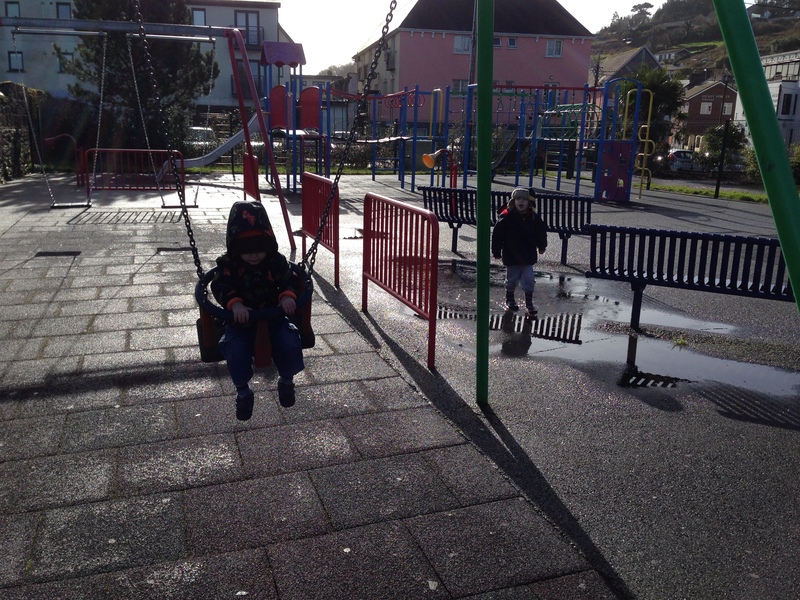 Go to a playground down the road to blow off some steam. Step 16: Conclude that from now on you will just visit WebMD.com and buy a scale and a tape measure to measure your kids at home. Resulting disaster: 3 large tubs of toys were dumped down the stairs and strategically scattered in the most debilitating places to step on them with bare feet. Resulting disaster: Remember all of those toys that they threw down the stairs before breakfast? Well, now they shoved half of them out the mail slot and into the pouring rain outside our front door. Reason my back was turned: I was vacuuming the hallway outside the bedroom door. Resulting disaster: Both boys climbed on top of Jacob’s (rickety) changing table. They opened a bottle of Purel and smeared the contents around the room (well, at least one room got cleaned today). They took every book off the bookshelf. They emptied all 5 boxes of clothes from the changing table. They pulled all of the blankets out of Jacob’s crib. They attempted to empty the diaper pail (Haha! Mom scores 1/2 a point for preemptively moving the diaper pail off the floor). Resulting disaster: Every drawer in my kitchen was emptied onto the floor (the floor which, by the way, is covered in filth because I apparently can’t afford to turn my back long enough to clean it properly). Resulting disaster: They dumped 4 rolls of toilet paper into the toilet, tried to flush the toilet, and then started swirling around the overflowing mess with a toilet brush. Oh yeah, and the other half of the toys that didn’t get shoved out of the mail slot? They were in there, too. Resulting disaster: They emptied every drawer and basket in David’s closet and moved the clothes to the floor on the other side of the closet (by the way, I’d just finished folding the laundry and putting all of the clothes neatly away in said drawers). They dumped a bin of shoes and boots down the stairs for good measure. Reason my back was turned: I was loading the stroller into our car. So we could leave the house and take my childrens’ destructive tendencies elsewhere. We’re living in Fort Knox here, folks. I know that this is a battle I’m probably just going to lose again and again and again. And, even though it drives me crazy, I’m kind of okay with that. They are, after all, little boys who are exploring their world. They’re testing their limits. They’re experimenting (maybe they’ll grow up to be amazing scientists some day?). In the meantime, though, know that I’m watching you, boys. Even when my back is turned. 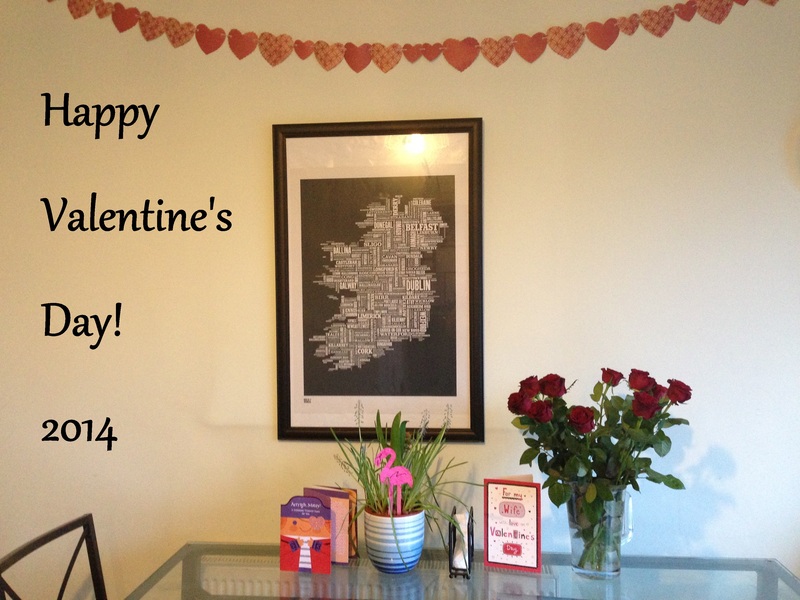 This weekend was our second Valentine’s Day in Ireland. Last year we were here over Valentine’s Day while Jon attended a local conference and we did some brief house-hunting for our then-upcoming move. Although last year’s Valentine’s Day with all of Jon’s co-workers at a company dinner was a unique experience, this year’s V-day was much more up my alley–the former-Kindergarten teacher in me came out in full force and we had a full day of crafts, scavenger hunts and baking. And I got a special date alone with my valentine, no third-wheel co-workers there to share the evening. But before I get into the details of our festivities, I have to share a bit about the weather this week. 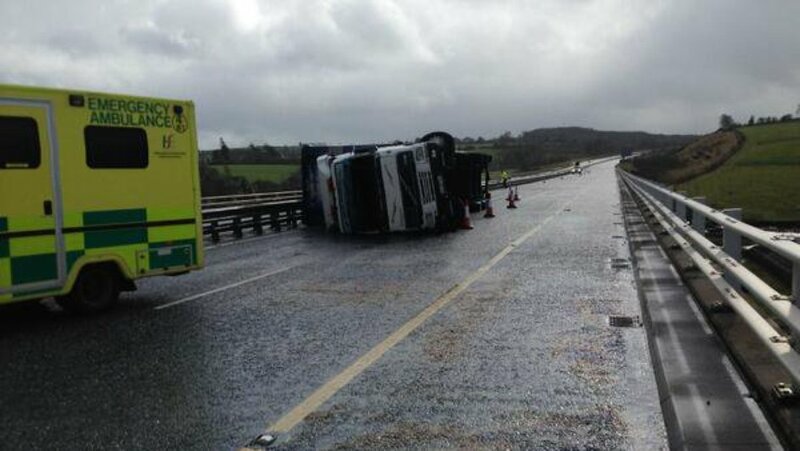 Another day this week brought ridiculous flooding to the Cork city center. 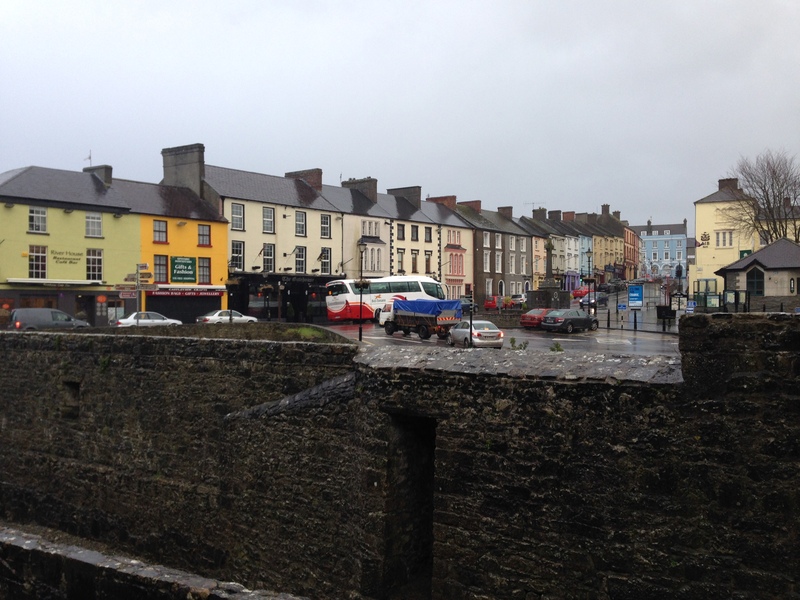 Storm surges converged with high tide and the River Lee overflowed its banks right into the middle of the city. 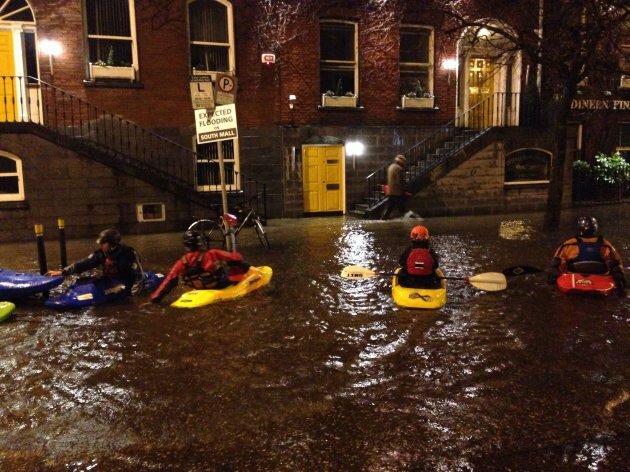 The flooding was so bad that people were kayaking down the main street. And inside the shops. It was madness, really. We were at an indoor play area on Wind Day and the front door to the building actually blew right off. It was like a scene out of The Wizard of Oz. Alrighty, then. 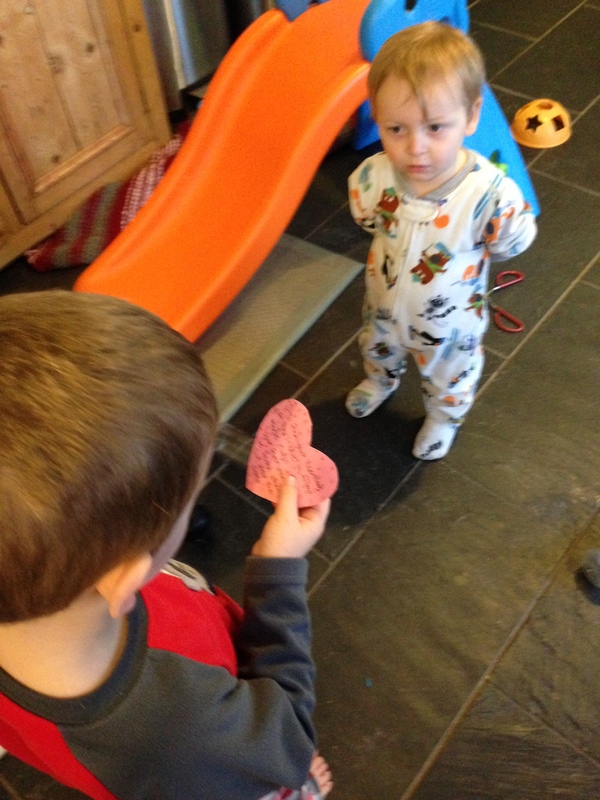 Enough of the weather, and on to Valentine’s Day! Valentine’s Day is not nearly the holiday here that it is in America. There are no conversation hearts and no Valentine exchanges at school (in fact, they don’t even sell boxed sets of Valentines at the stores here. Or heart-shaped candies. Really, the only thing Valenine-y I could find was red roses and fur-rimmed handcuffs….hmmm…). The holiday is reserved for lovebirds, but I really prefer the American all-inclusive nature of the holiday. 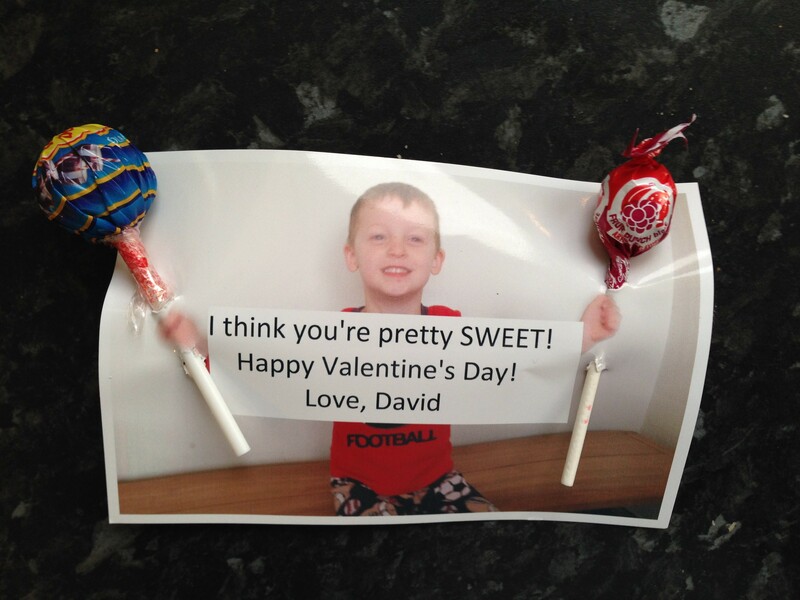 I love celebrating Valentine’s Day with friends and, especially, with my kids. 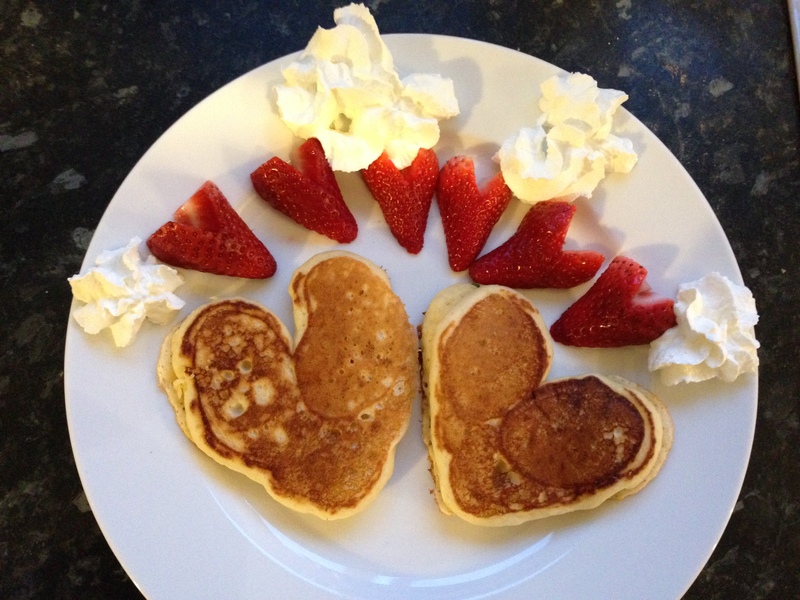 And, by the way, the heart-shaped pancakes were a roaring success! Perhaps the fact that I smothered the ‘cakes with berries and whipped cream had something to do with the rate at which they were ravenously consumed. But, hey, it’s a holiday, gotta go all-out. 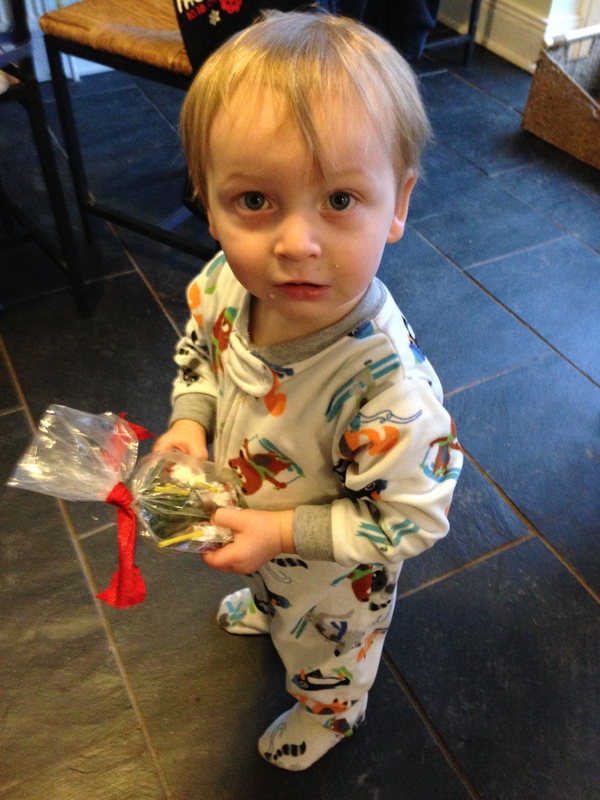 At the end of the scavenger hunt each boy found a little treat bag. And, since I couldn’t find conversation hearts or cupid-shaped chocolates, they got plastic army men and soccer ball lollipops. We also opened our Valentines that arrived from overseas. Thanks for all of the cute cards, grandparents and cousins! Our next activity on the agenda was a bake-a-thon. I didn’t really mean for it to be a bake-a-thon, it just turns out that having a 3 year old “helping” you in the kitchen turns into an all day affair. 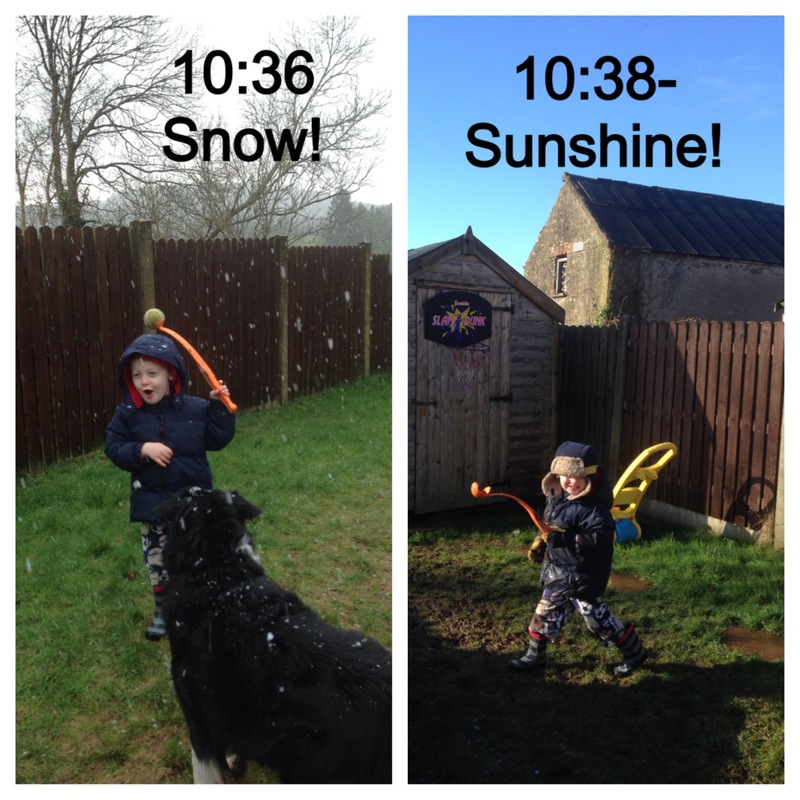 No bother, though, we didn’t have anywhere else to be (as evidenced by my son still wearing his pajamas in these photos…at 1 in the afternoon.). 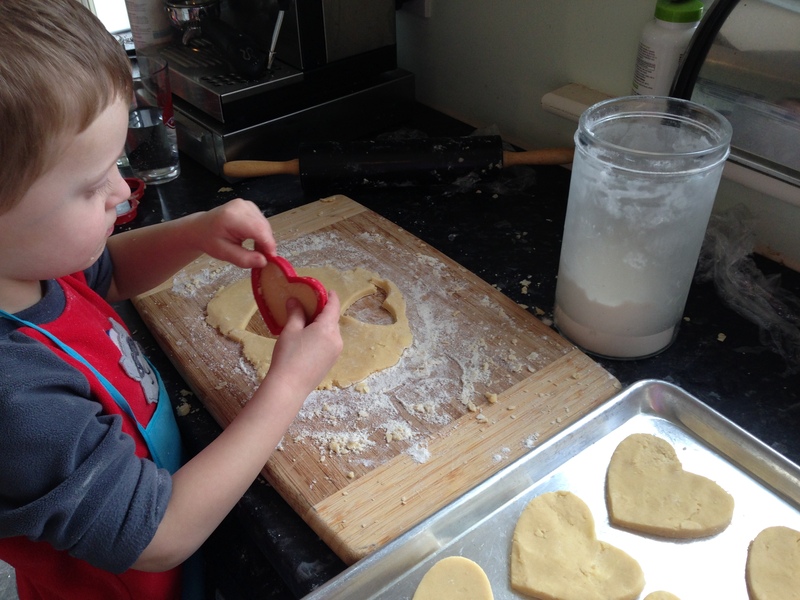 We made a big batch of chocolate-dipped shortbread cookies–heart-shaped, of course! David was my sous chef extraordinaire and, I have to say, the cookies turned out quite delectable. While the cookies were baking in the oven I made lunch: soup and heart-shaped grilled cheese sandwiches (are we starting to see a theme yet?). 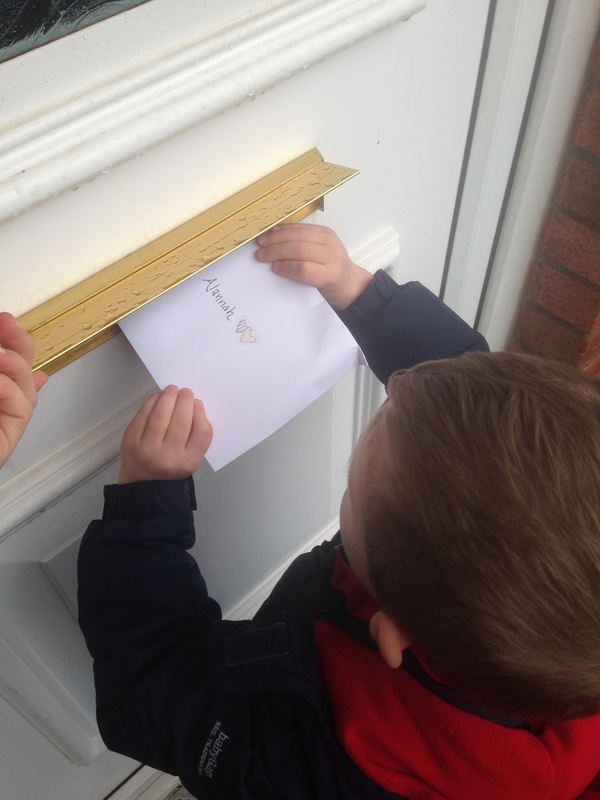 David loved playing post man and putting the cards inside his friends’ mail slots. 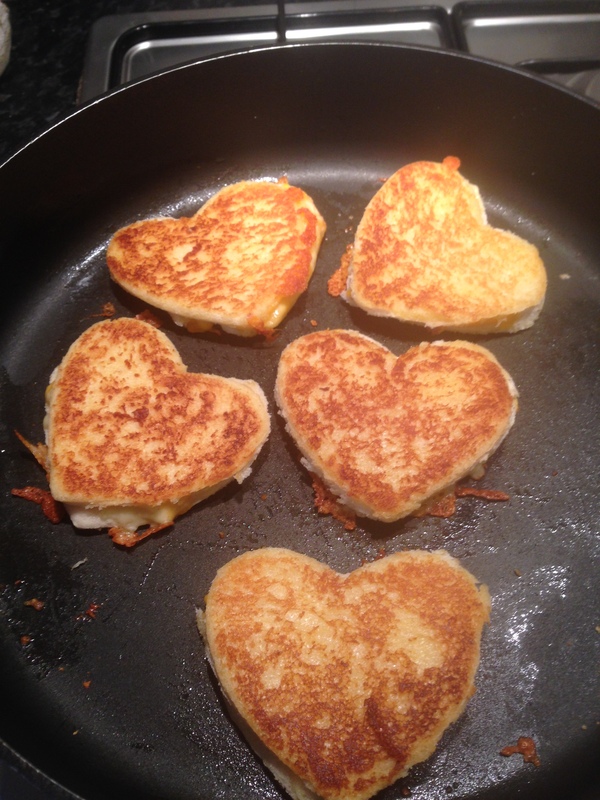 After we delivered our Valentines it was time to go back home and make dinner (back to the kitchen again…). 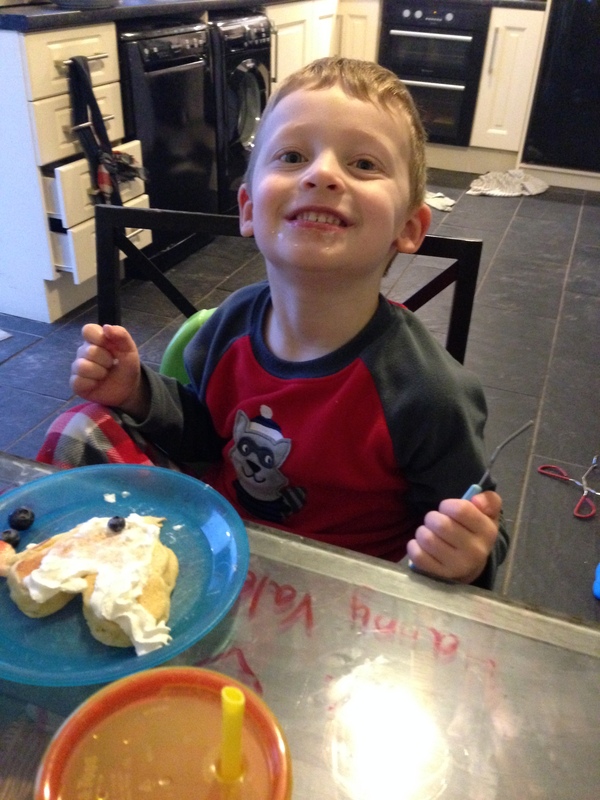 We had a nice steak dinner–the boys, however, decided to go vegan and just eat their broccoli. Oh well, more steak for ME! So, the day after Valentine’s Day we got a babysitter and went out, just me and my valentine. 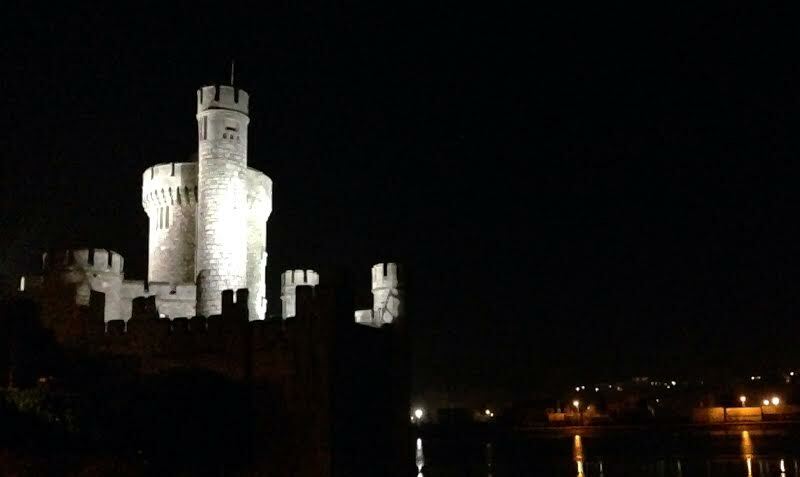 We had a romantic dinner at Blackrock Castle–there was candlelight, red wine, and not a single screaming child. It was sublime. After dinner we headed over to Carroll’s Bar, a pub that is owned by our friend Olivia and her family. 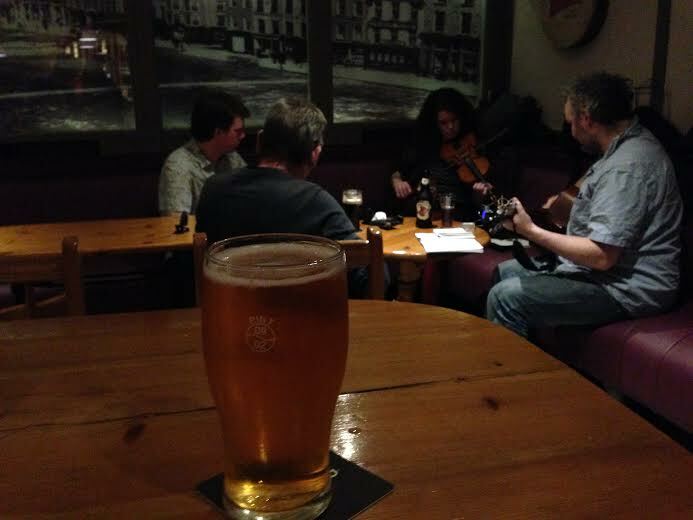 Every weekend they have trad (traditional Irish music) at the pub and I’ve been wanting to check it out for months now. We were not disappointed. The music was lively and they even had a nice, cold IPA for Jon to try (he’s been missing all non-stout beer since we’ve moved here). 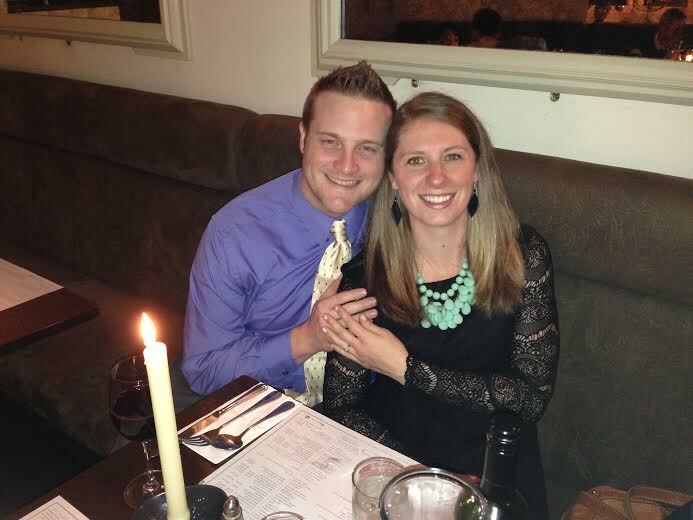 It was the perfect ending to a magical (Irish) Valentine’s Day. 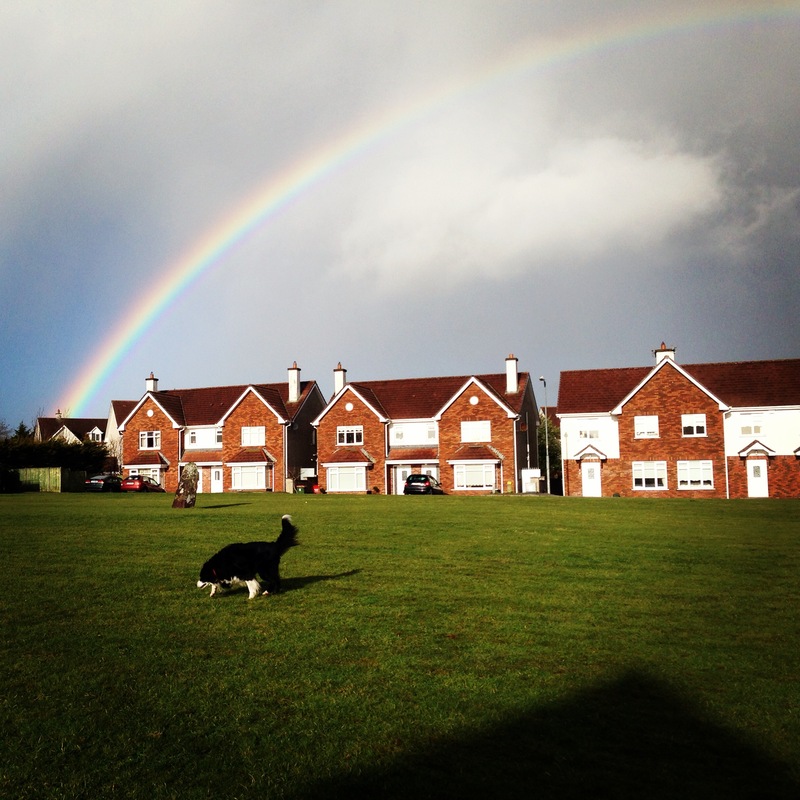 Rarely does a day go by that I do not see beautiful Irish rainbows. Of course, that means that it rains a lot here, but that also means that the sun is sure to follow. I will never get tired of looking out my window to see beautiful colors painted across the sky. 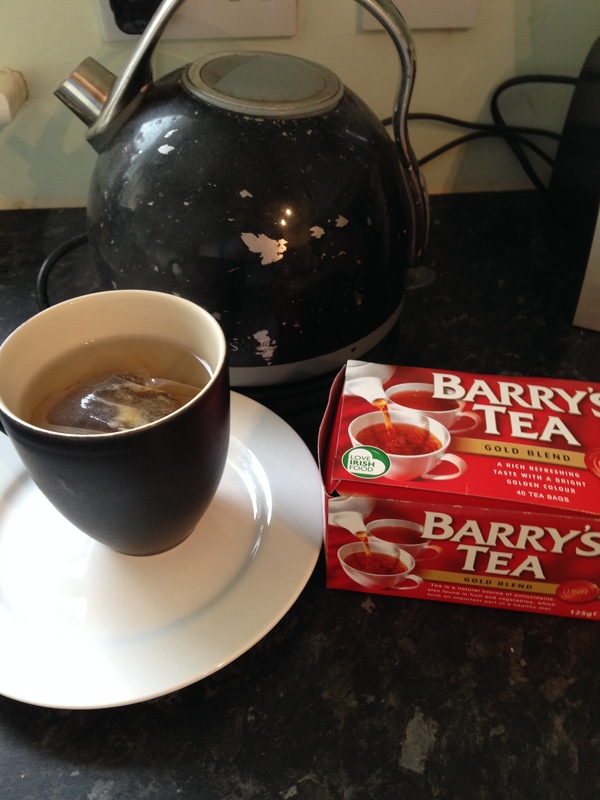 Tea is to Irish as…I don’t know…life is to Americans? Seriously, these people love their tea! And for good reason. The tea is good, but even better is the lifestyle that comes with a culture built around tea consumption. You have to slow down to drink tea. You have to take breaks in your day. You have to invite others over to drink tea with you, and you have to accept invitations to drink tea with others. Sometimes you even have to eat cake with your tea. You see, tea is a very, very good thing. 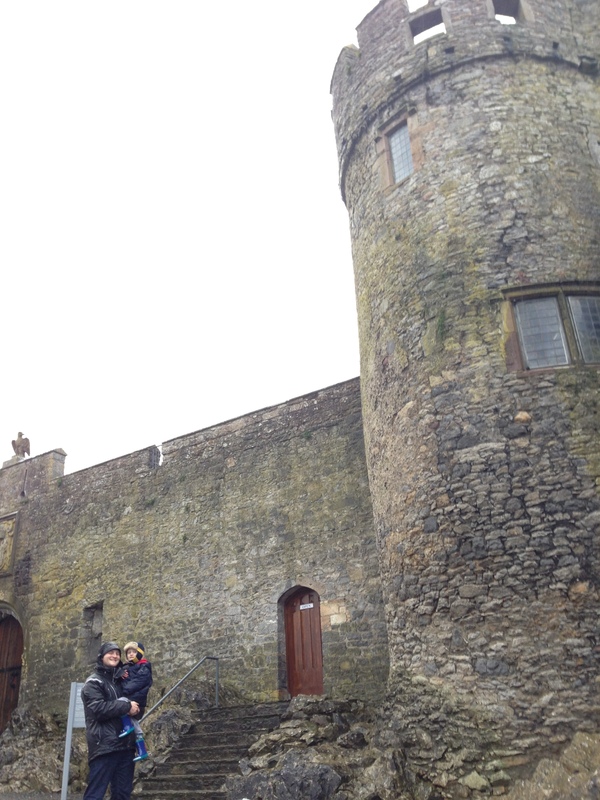 Ireland: 2,000 (castles, still standing). 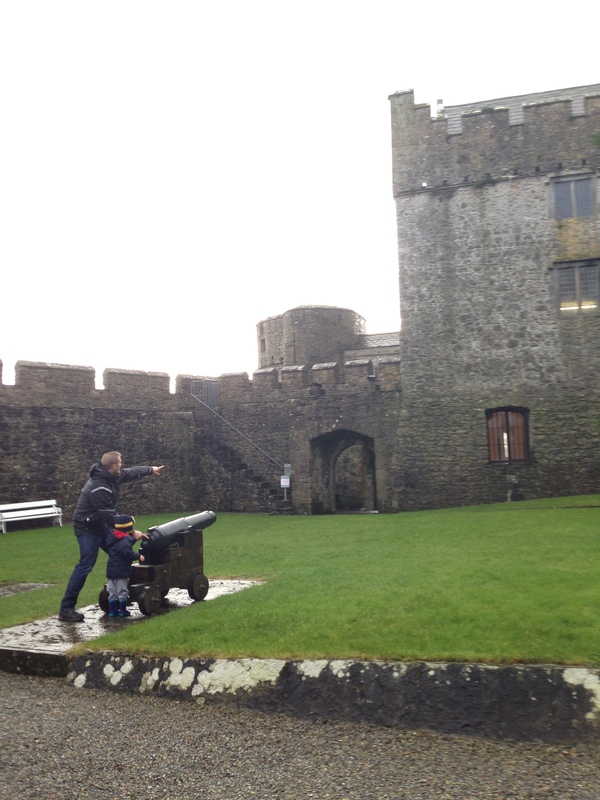 United States: 0 (castles, ever). 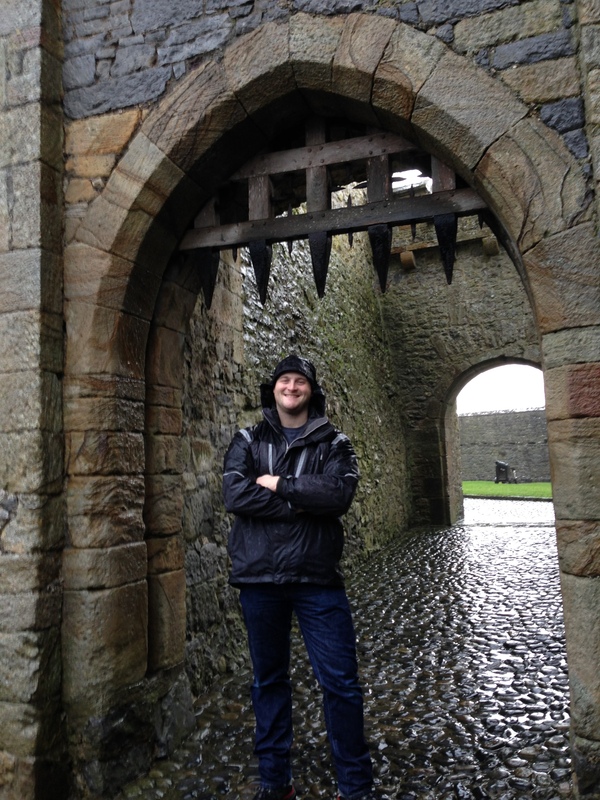 Castles are just really cool. I’m sure that only parents of young children can really appreciate the significance of this, but family parking is incredible. Most shopping centers here have special extra-wide parking spaces located near the store’s entrance that are reserved just for families. They’re really VIP parking spots. And, let’s be honest. I’m a mom. I like to feel special. I like to feel appreciated. 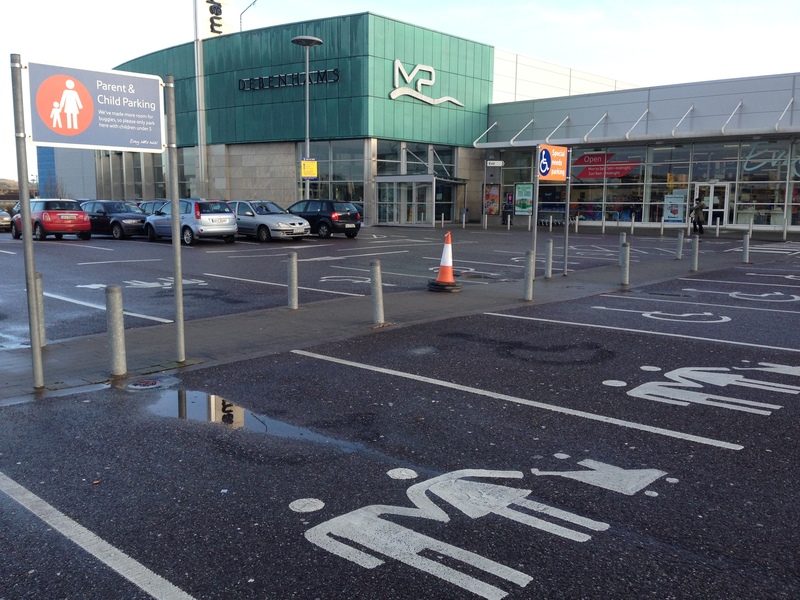 Thank you, Irish shopping centers, for giving me that little boost every time I go to park my car. I’ve always wondered why this isn’t more common in America. 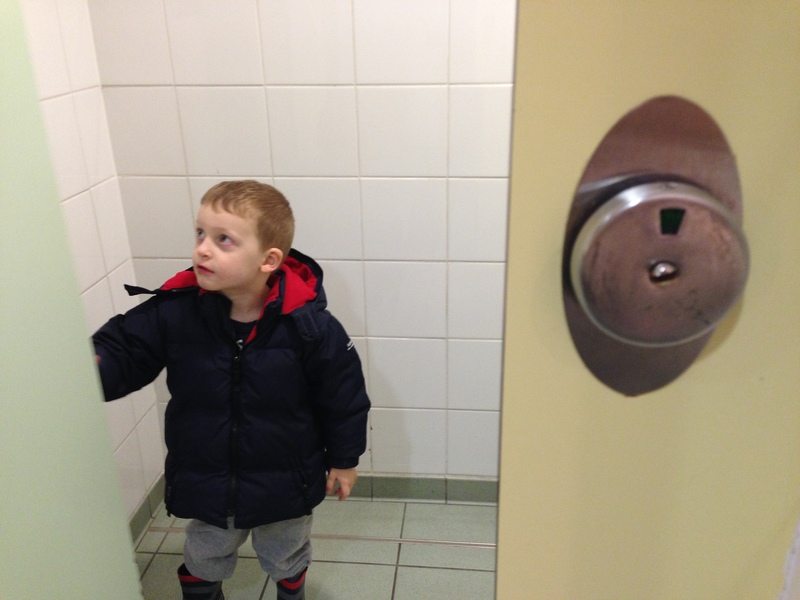 Instead of entering a public restroom and peeking under the door of every stall to see if anyone is inside, you can just look at the indicator on the door. Red? Move along. Green? Step right in. Europeans are, in general, more eco-conscious than most Americans. In Ireland I have seen people hang their clothes on clotheslines in the middle of winter to avoid wasting energy on dryers. Everyone drives manual diesel cars because they use less gas. They are sticklers for recycling. Alarms start going off if my fridge door is left open for more than 30 seconds. 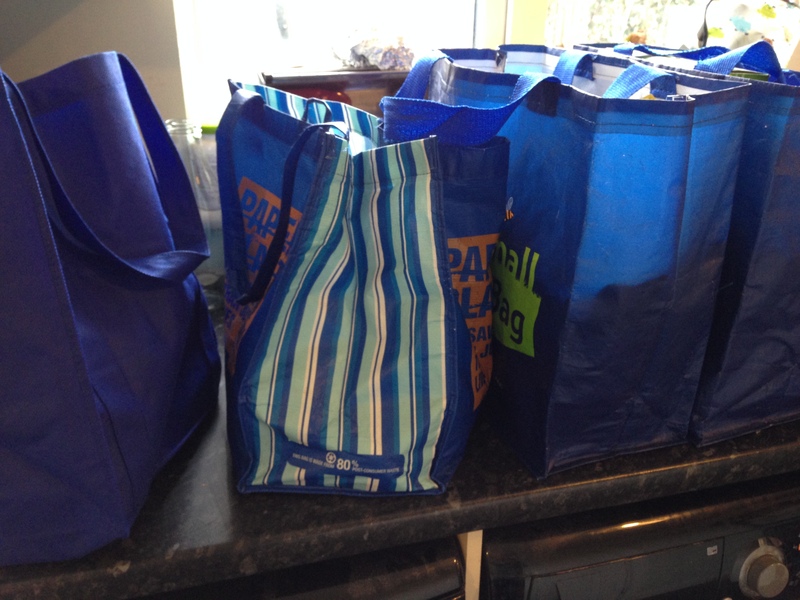 There is no such thing as a plastic bag in this country–anywhere. Bring your own reusable bag or buy one at the store, those are your only options. And the best part about all of this is that living this way is just, well, how people live–you don’t have to think about it or go out of your way to make these eco-conscious choices because they’ve already been made for you. All working people in Ireland–whether they are the CEO of a major corporation or flipping burgers at McDonalds for minimum wage–are entitled to at least three weeks of vacation time per year. And everyone takes their vacation time. All of it. Conversations revolve around where you will be going for your holidays this year, not if you will get any time off. Holidays here are not a privilege, they are a right. And for someone like me who is always dreaming of the next vacation, I think this is a pretty good way to look at things. 8. Milk. Cheese. Butter. Cream. Dairy, dairy, dairy! 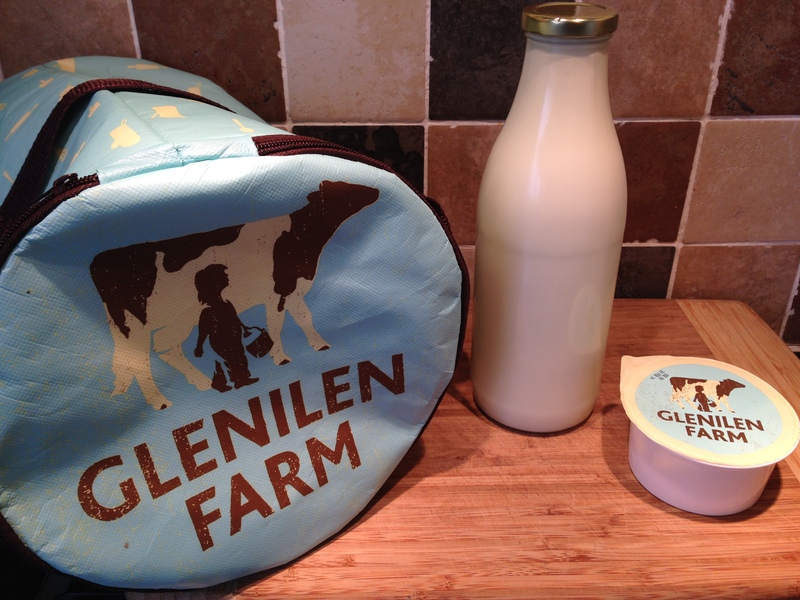 I have never tasted anything quite so delicious as fresh Irish dairy products. The milk is creamier, the cheese is richer, the ice cream is smoother. The butter is so amazing that David literally eats in by the spoonful straight out of the container (at least, until I catch him and remind him that butter is not one of the basic food groups). And I know why. There is a farm behind our house and from my kitchen window I can see the dairy cows that live there. There are only about a dozen cows and all they do all day is wander up and down lush green hills munching on grass and frolicking beneath rainbows. Irish cows are happy, happy cows. That makes for some durn good milk. Having a baby in Ireland is a pretty sweet deal. 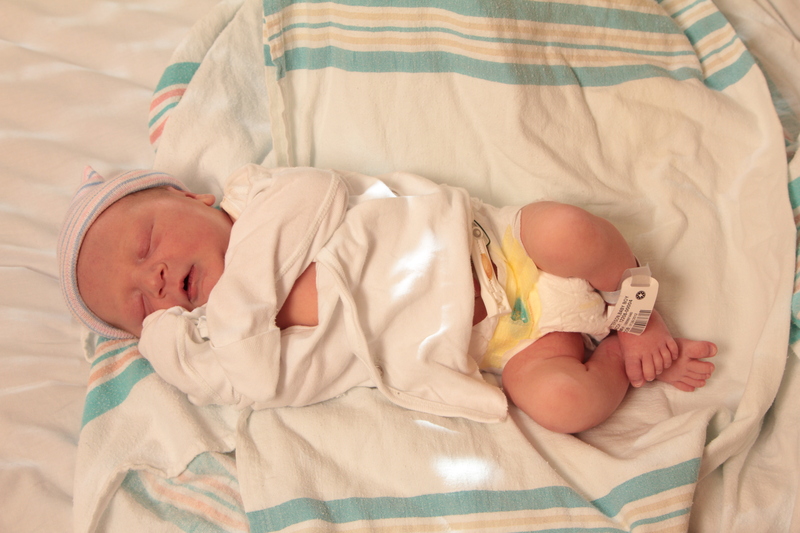 There are no medical costs to the parents for prenatal care, labor, delivery, or recovery. None. Zip. Zilch. After the baby is born, mothers in Ireland are entitled to about 6 months of maternity leave–and the government pays them a stipend each month that they are away from work. There are also government stipends available to new parents to buy essential baby items, a stipend that the government gives you for each child every month (just because), and a stipend to send your child to preschool for FREE. It’s madness, really. 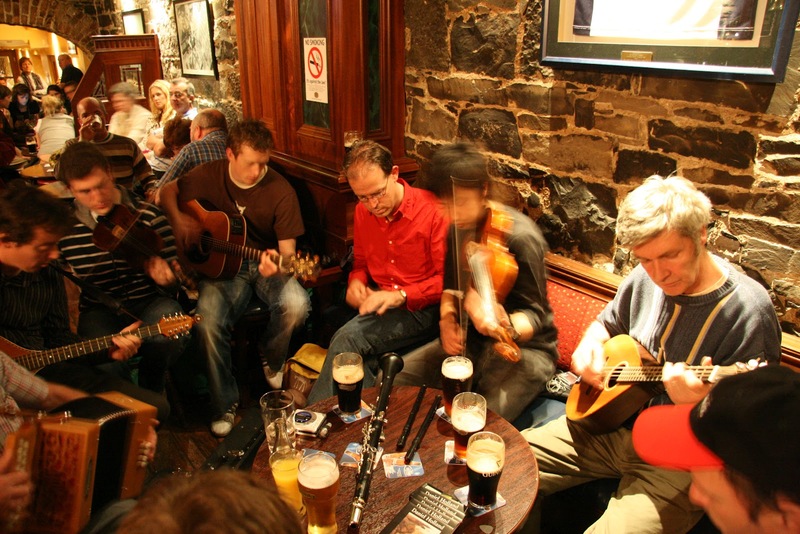 Craic is the Irish term for having a jolly-good time–and the Irish are experts at it. They know how to relax and just enjoy life. Schedules, deadlines, and duties often take a backseat to friends, beer and good music. I can appreciate that. Now, excuse me for a bit. All of this talk about Ireland and I think I need a pint of Guinness. Perhaps with a chaser of butter. It’s February, which means Valentine’s Day is just around the corner. I’ve always enjoyed Valentine’s Day–a whole day to shower our loved ones with affection (and chocolate. Lots and lots of chocolate). Every year for Valentine’s Day we make cards for our family members. Usually this involves coloring hearts or painting a picture. Since we recently moved thousands of miles away from all of our family, though, I wanted to do something extra-special for them this Valentine’s Day. Something to show them that we were still thinking of them even though we are far away. And that’s when I remembered the “long distance hug”. Inspired by this idea, I came up with this unique valentine to send to our far-away loves. Here’s the how-to if you’d like to send your own virtual hugs! I was making a large batch of these valentines, so the first thing I did was trace each boy’s hand onto cardstock to make a tracing template for the handprint cutouts. Then I used my handprint templates to trace several hands on colored paper. I used cardstock, but construction paper or scrapbook paper would also work well. I folded each piece of cardstock in half so that every time I cut out a handprint I got 2 cutouts. For each valentine I used one “David handprint” and one “Jacob handprint”. I used red paper for the David handprints and Orange paper for the Jacob handprints. You could just as easily make a separate valentine from each child and use two of the same handprint for each “hug”. Next, I folded each handprint into the ASL sign for “I love you” (just fold down the two fingers between the pinky and pointer finger). I glued the fingers in this position so they would stay in place. To make the “arms” for the hug I decided to do an accordion fold using two colors of scrapbook paper. I cut out 1-inch strips of the paper and then taped three strips end-to-end so I would have pieces long enough to fold (the taped-together strips ended up being about 30 inches long). Then I taped together two of the long strips of paper at right angles and began folding the strips together like an accordion. *Note* If you are planning on mailing your “hugs” you may have to pay for extra postage if you make the accordion “arms” as they make for a bulky envelope. If you want something that will stay flat in an envelope you can use ribbon or string instead of the accordion arms. The finished product was just as cute as the boys who made them! My hugs from very far away. And feel my love for you, day and night. How much I LOVE YOU as I grow. I carry you close to me in my heart. Happy crafting, and happy Valentine’s Day! If you like this project, you may also enjoy the apple stamp valentines that we made last year. 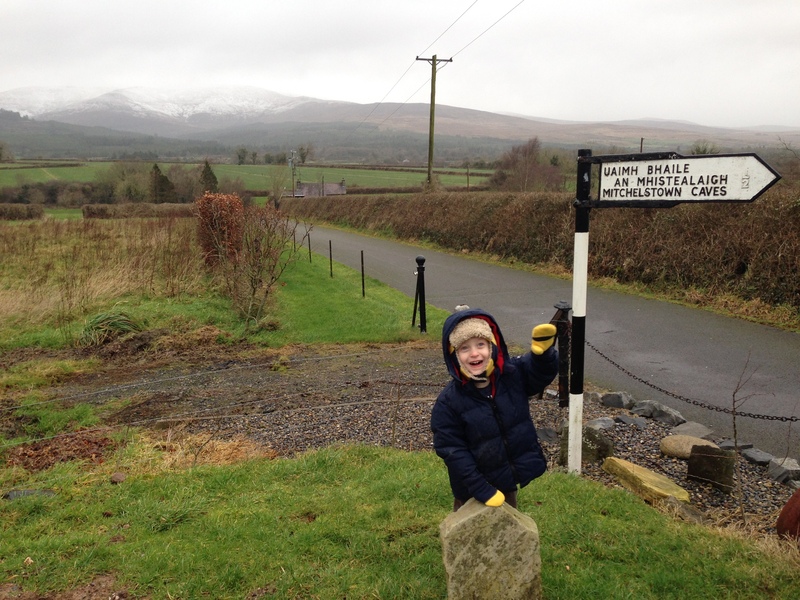 This week brought several storms through Ireland–blustery wind, chilling rain, and even snow in the “mountains” (the quotes are there because Irish mountains are nothing like Washington mountains. They are simply taller rolling green hills than the rest of the rolling green hills that dot the countryside.) Nevermind the storms, though, adventures were still out there waiting for us. 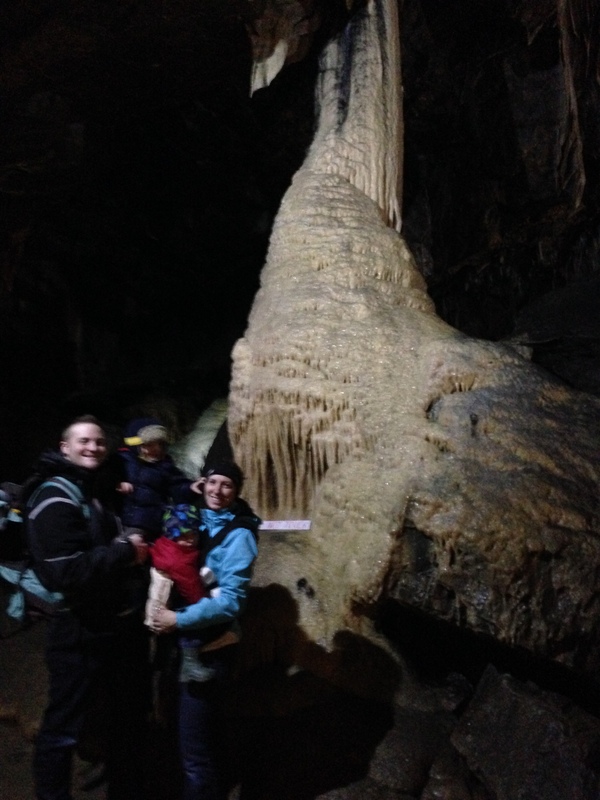 I found a nice indoor activity for our family that would get us out of the wind and the rain: cave exploring. After a quick stop at our new STARBUCKS (!) in town, we were on our way. 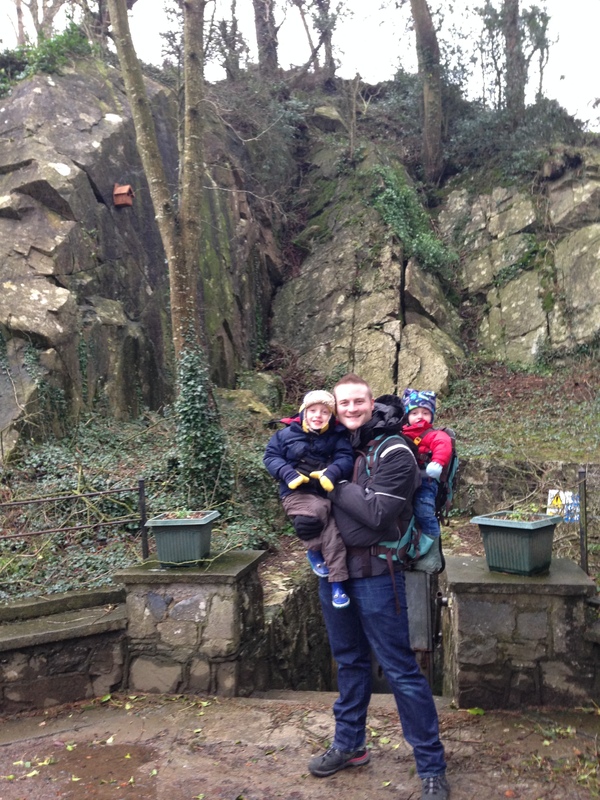 The caves we went to are called the Mitchelstown Caves, and they’re only about 45 minutes outside of Cork. We drove up early Saturday morning and we were the first (only?) visitors of the day. I guess other Irish people don’t have my same sense of let’s-go-cave-exploring-in-a-storm adventure. Once you get inside the caves, it is absolutely breath-taking. Stairs lead you down into the caverns where you can see all sorts of stalactites (the mineral deposits that hang from the ceiling like icicles), stalagmites (the little mounds that form on the ground beneath stalactites), pillars (where the stalactites and stalagmites eventually meet to form a floor-to-ceiling column), and “curtains” (intricate patterns of mineral deposits that cover the cave walls, looking like a gently-folded piece of cloth). Limestone stalactites like these form at the rate of about 1 inch every hundred years, so you can imagine how long some of these bad boys have been growing. I didn’t know that rocks could be so beautiful. 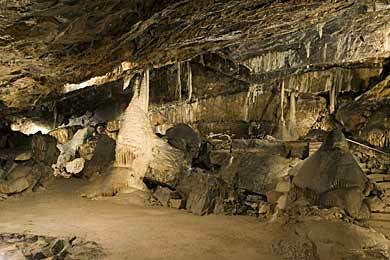 Photo courtesy of Google Images since we weren’t allowed to take photos inside most parts of the cave. We all loved the caves and will definitely try to return again some day. 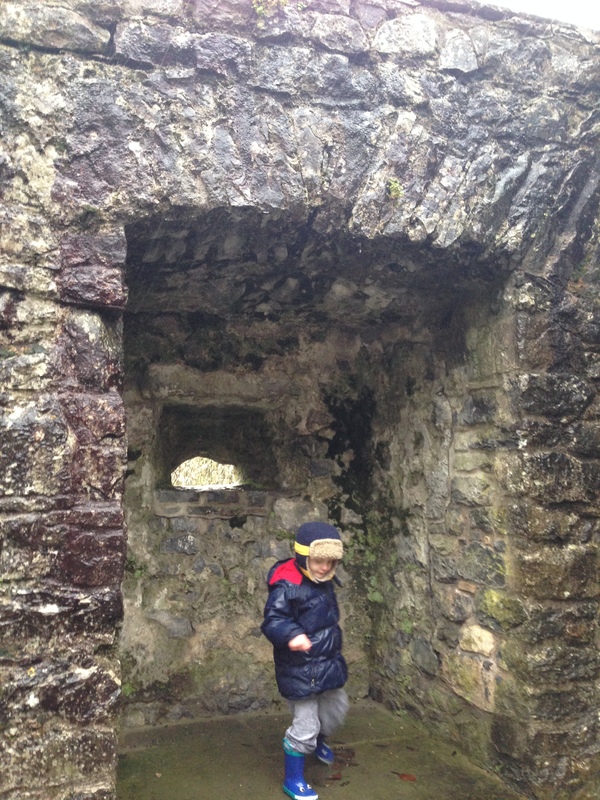 …it was on to Cahir Castle! 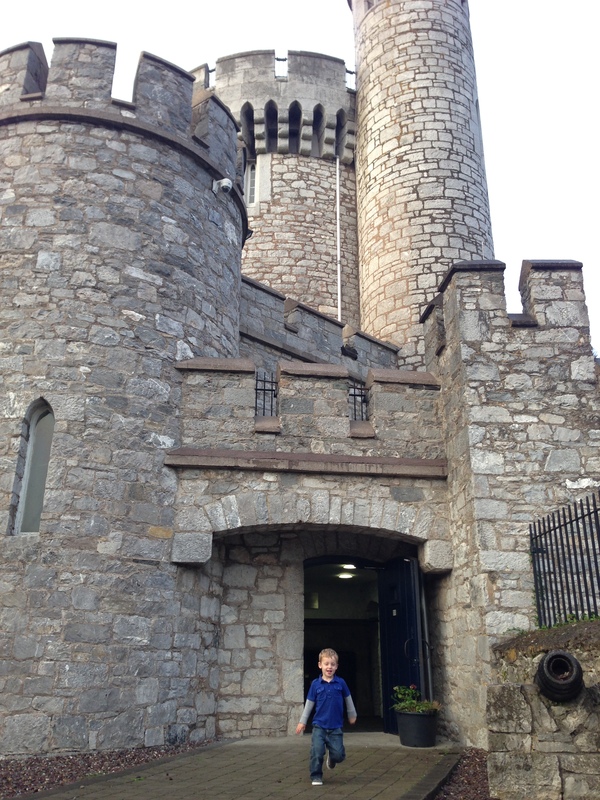 There were several rooms of the castle that we could walk through. Even though the castle was built in 1142, the preservation work that they have done in this castle is beautiful and really gives you a picture of what life would have been like inside these walls. This was the banqueting hall. 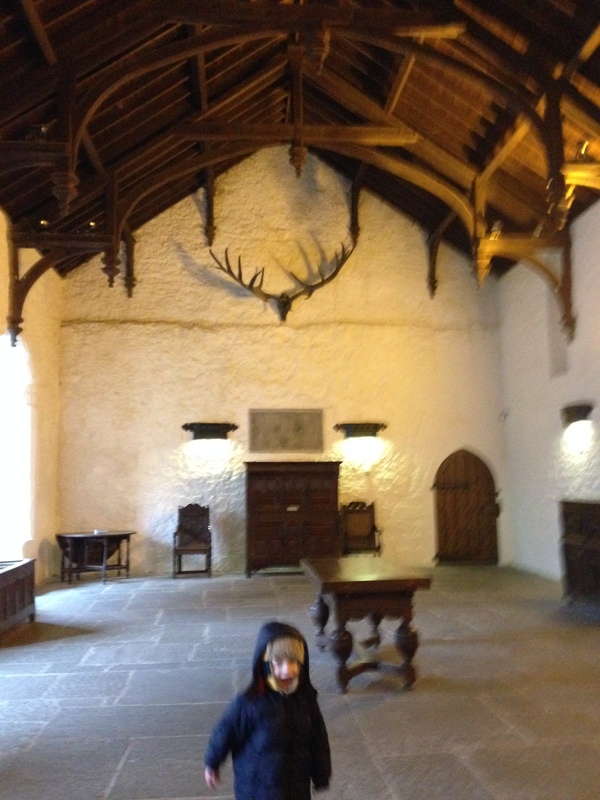 Note the huge ancient Irish Deer antlers hanging on the wall. These animals weighed between 800-1000 pounds and stood over 6 feet tall, with antlers nearly 12 feet wide. I would have loved to see one of those creatures in real life! 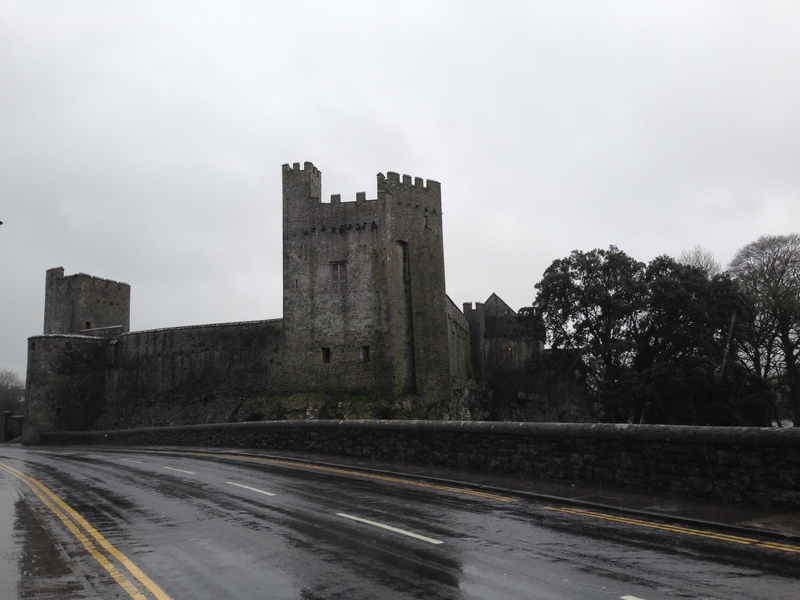 As we came to the outer edge of the castle wall I marveled at how the town of Cahir just exists here. With a castle across the street. I wonder if the people who live and work and shop here realize how cool that is. 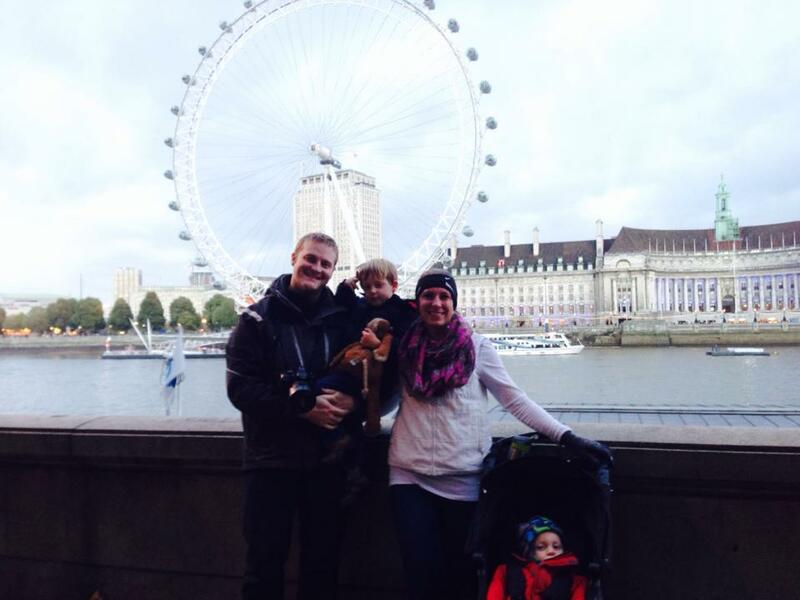 It was a day full of adventure–and misadventure turned into adventure. But isn’t that what adventure is all about? The planned and the unplanned, the known and the unknown. The journey. Even if that journey takes you 16 kilometers out of your way.